See our news and pictures on Facebook: Click Here! September 2016: Sharon Salvaggio (PICTURED), talented quilter from a local group and cancer survivor, stands with the recent donation to Lily’s Hope. The quilting group have donated about 30 bags each year for the past three years to women who are attending Lily’s Hope for their wig, cap, hat or scarf. Women who live in, or are being treated in Chautauqua County can come to Lily’s Hope for these and more supplies – FREE of charge – due to the generosity of the Zonta Club of Jamestown and our community. If you are going through cancer treatments, you’ve already had enough. The big C is capital S-C-A-R-Y. And no one knows that more than those who have gone through it, are going through it, or watched someone battle it head on. All the pokes and prods, all the blood work and tests. The sick feelings, the worry and time spent wondering. Time from work. Time from family. And then there’s the physical issues. Not feeling well. Not knowing what to expect next. Then, loss of hair with chemotherapy. Lily Olson, a past President of the Zonta Club of Jamestown, breached the topic at a regular business meeting a little over 5 years ago this month. A friend of hers was a nurse who drove patients to cancer treatment appointments and remarked to Lily that on top of all they are dealing with, they have to drive to Buffalo or Erie to get a wig so they could feel better about how they looked. Lily came up with a great idea to help those women so they wouldn’t have to do that extra drive. 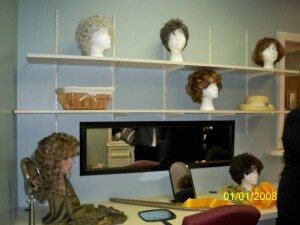 A room, locally, where women could get a wig or hat. She asked the club if we could do something – that we SHOULD do something. The club set to work. 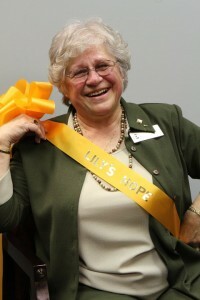 A few months later, and with a collaboration with WCA Hospital’s wellness program, “Lily’s Hope” was born. 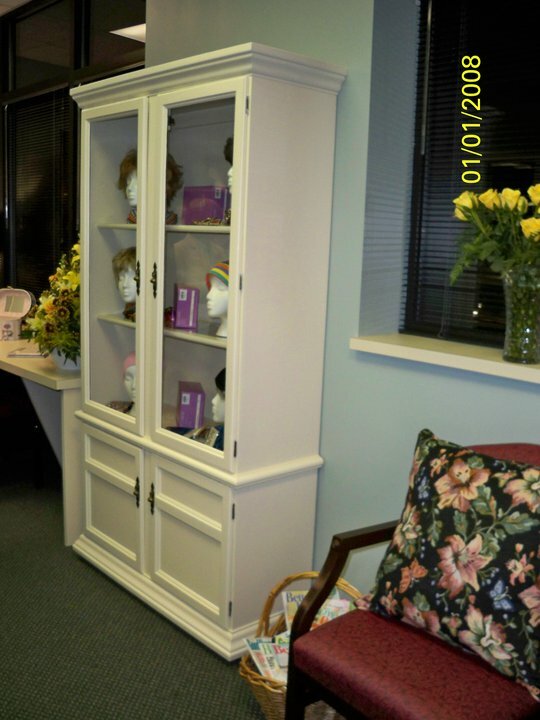 At the Cancer Treatment Center at Jones Memorial Hospital, there is now a room called “Lily’s Hope.” It is stocked with donated and new wigs, caps, hats, scarves, bags, pillows and other fine accessories. Lily’s Hope has really taken on a life of it’s own, garnering monetary donations of 100’s and up to several $1,000’s of dollars from the club’s fundraising efforts and the community. Knitting clubs have donated knitted items. Quilters have formed guilds and quilted items for patients. Children in a local middle school have made pillows. There’ve been fundraisers by companies, community groups and individuals. There is even a soup contest each year in May! Meeting with a cancer patient and looking at their face as they try on wigs and are fit for hats for their journey is truly an amazing experience. The range of emotion is there. The excitement of something new and fun. The sadness of the illness. The patience of trying multiple wigs to find the right one. But then the delight and thankfulness of receiving this piece of hope for free…. breath-taking. To schedule an appointment for Lily’s Hope call the WCA Cancer Treatment Center at 664-8670. PLEASE VISIT LILY’S HOPE ON FACEBOOK AND “LIKE” US TODAY! PICTURE: Pillows made by Marcy Miller’s FACs Class at Persell Middle School. 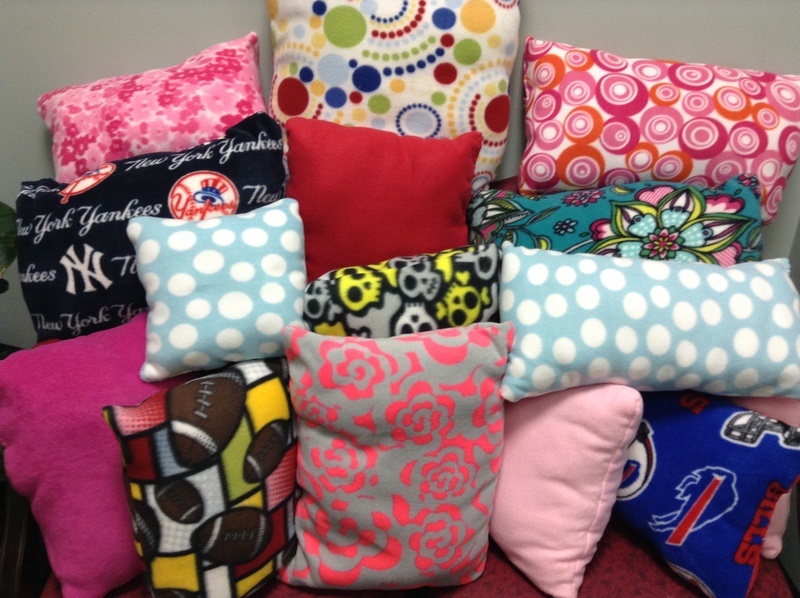 Lily’s Hope has been the fortunate recipient of another set of pillows created by Ms. Marcy Miller’s FACs class at Persell Middle School. Learning to sew is just one of the skills taught in the class. This is the second donation of pillows to “Lily’s Hope” in the past year. The students elected to have the donation of pillow to Lily’s Hope to help comfort women going through cancer treatment. L-R: Joyce Seekins, Ellen Munella, Bonnie DeJoy, BettyLou Blixt, Mary Anne McAulittzThe evening of November 12th was clear and chilly. At Friendly’s in Brooklynn Square in downtown Jamestown the dinnertime rush was on! This was also the night the Breast Cancer Support Group was gathered for their regular Wednesday meeting. What was about to happen at this regular meeting however, was so far removed from the coolness of the coming winter outside. It was warm and loving. For also called to this meeting were representatives from the Zonta Club of Jamestown: The Zonta Club President, Bonnie DeJoy, and members Ellen Munella, BettyLou Blixt and Rosie Papalia were in attendance. 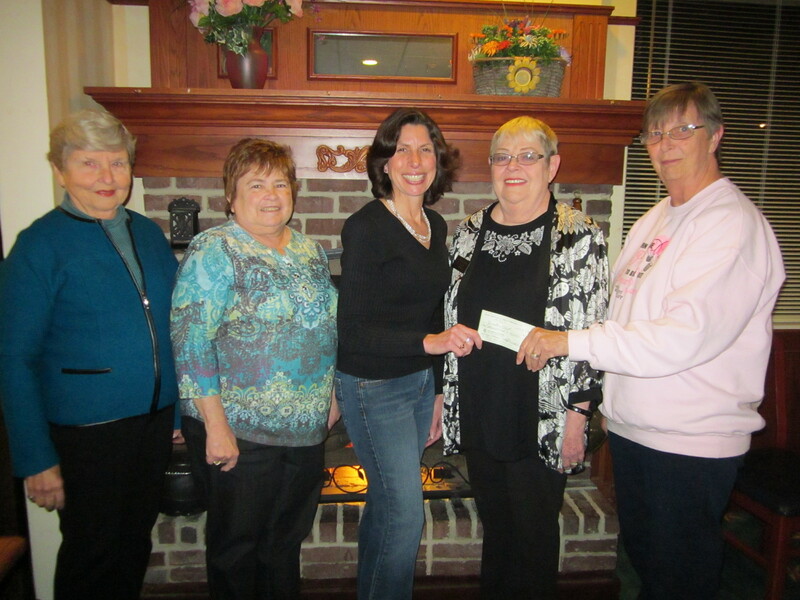 The Breast Cancer Support Group surprised Zonta with a $1,000 check earmarked for “Lily’s Hope.””Through Lily’s Hope, Zonta Club of Jamestown has been fortunate to be able to bring comfort to local women going through the trauma of cancer treatment. 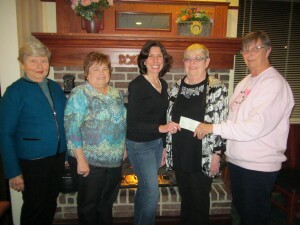 Support from individuals and groups such as the Breast Cancer Support group enables us to continue this program. We are now able to expand our efforts to new areas, and are most grateful for all who help us.”, said Ellen Munella of the check. “Lily’s Hope” at the WCA Cancer Treatment Center here in Jamestown is a resource for women who live in, or are being treated in, Chautauqua County for a medical diagnosis where they are losing their hair. This resource provides women with a wig, hat, cap, scarf or turban, free of charge. In some cases if a woman cannot find a wig at Lily’s Hope that she likes the Zonta Club will order a wig of her choosing for her. Thus far, the Zonta Club has given out over 250 wigs to women in our area. The Zonta Club also accepts donations of new or gently used wigs which go to BOCES for cleaning and styling before being displayed at the Cancer Treatment Center at Jones Memorial Hospital. 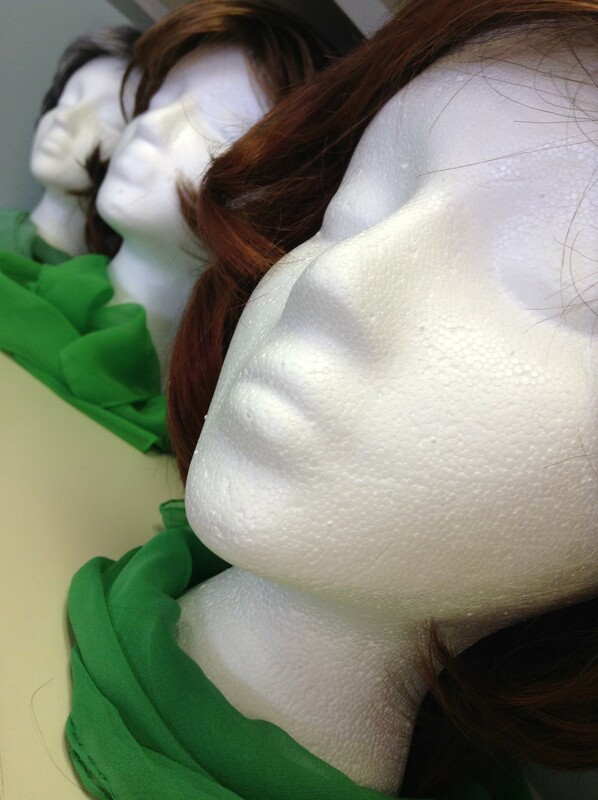 BOCES has been donating their time and talents to assist with the wigs. Supplies have been donated for women from many local businesses as well. Cala Lily Yarn Shop has directed knitting projects toward Lily’s Hope. As well, the new “whispers boutique” at Patient’s Pharmacy on Main St. features the Lily’s Hope service. If you, or someone you know needs a wig, hat, cap or turban, they may contact the WCA Cancer Treatment Center for an appointment by calling 664-8670. In this blessed holiday season, “Lily’s Hope” by the Women of Zonta, has received a very generous anonymous donation of $1,000 for wigs and supplies. 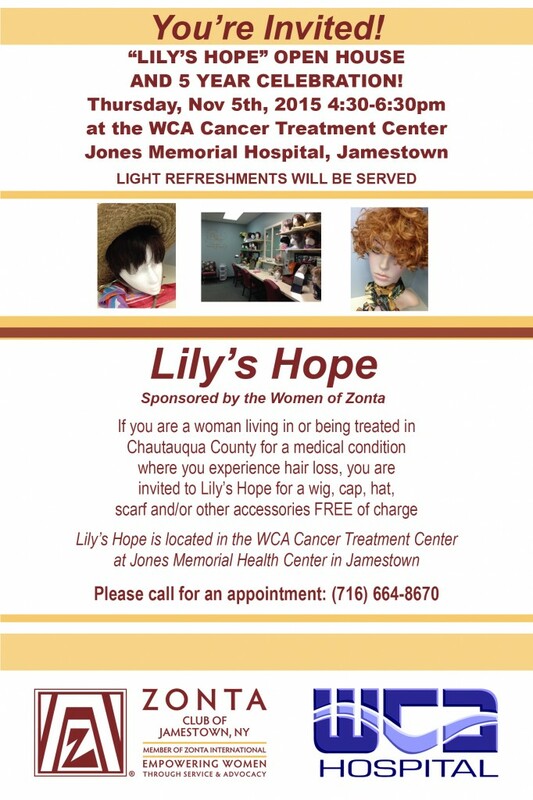 Lily’s Hope is housed at the WCA Hospital Cancer Treatment Center at Jones Memorial Hospital and provides FREE wigs, hats, turbans and scarves to women who are going through Cancer Treatment in Chautauqua County, or who live in Chautauqua County and are in need of any of these items. Established by the Zonta Club of Jamestown in November 2010, “Lily’s Hope” has provided over 60 Wigs, Caps, tubans hats and scarves to local women. November 2010 the Zonta Club of Jamestown held the Grand Opening of “Lily’s Hope” a resource for women in Chautauqua County undergoing cancer treatment who need a wig, cap, turban or scarf due to their treatment and loss of hair. These items will be provided FREE OF CHARGE to those women in need. 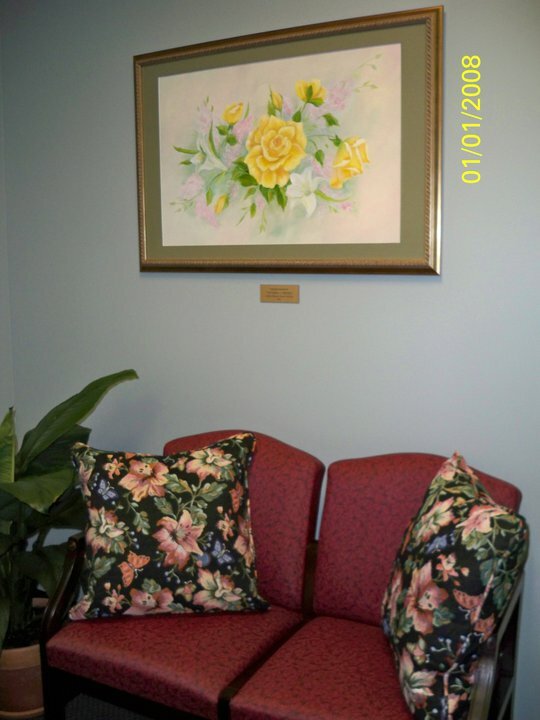 This room is sponsored by the Zonta Club of Jamestown and in partnership with WCA Hospital. This is the only local facility of this nature. If you, or a woman you know is in need of this service, they can contact Toni DeAngelo at WCA Hospital to setup a time to view and try wigs/caps/scarves. Donations of wigs/caps/scarves or turbans are greatly appreciated and accepted. Monetary donations are also accepted: make checks payable to Zonta Club of Jamestown with “Lily’s Hope” on the subject line and send to PO BOX 913, Jamestown NY 14701.